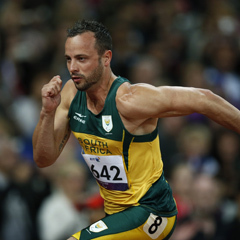 London - Oscar Pistorius and Fanie van der Merwe gave Team South Africa a final shove up the medals table as they ended their 2012 Paralympic Games campaign on Saturday in 17th position. Pistorius brought the curtain down, storming home to win the T44 400m final in a Paralympic record time of 46.68 seconds. “It was a blessing for me that I could finish off the whole summer here in London 2012 with the last race in this stadium,” said the double gold medallist. “I wanted to give the crowd my best but I was quite nervous and also quite tired after this week. “I could actually hear the crowd [while] coming into the home straight. Americans Blake Leeper and David Prince took the silver and bronze medals in 50.14 and 50.61 respectively. Alan Oliveira, who beat Pistorius to the gold medal in the 200m final, finished fourth in 51.69. Van der Merwe finished his race in flamboyant style diving across the line to ensure the gold medal. Running neck and neck with Chinese athlete Yongin Liang, the two athletes finished in the same world record time of 11.51 seconds, but replays showed Van der Merwe’s chest crossed the line a fraction of a second ahead of Liang. “Seeing the Chinese guy next to me, I knew a normal dip wasn’t going to do it so I thought I’d give it a dive,” said Van der Merwe, who was born with cerebral palsy. The 26-year-old from Welkom cut his hands, his elbows and his knees in his dive but said he was used to it and would do it again if necessary. “Liang was ahead all the time so I tried to keep him close and at the end I realised I had a chance and went for it. “If everything works out well, I plan to go to Rio but it’s still a long way away. Roman Kapranov finished third for the bronze medal in 11.56 seconds. Collecting more silverware for South Africa were Anrune Liebenberg, Dyan Buis and Kevin Paul. Liebenberg came second in the women’s T46 400m final, setting a personal best time of 56.65. “I was very nervous for the final because it is my main event but it was really something to run my personal best,” said the 19 year-old who was born without her left hand. She was beaten by Yunidis Castillo of Cuba who set a world record in 55.72 with Alicja Fiodorow from Poland securing the bronze medal in 58.48. “Yunidis is an incredible athlete and congratulations to her on a world record,” said the bronze medal winner of the T46 200m event. “I know how hard she worked for that gold so she deserves it. Buis won his second silver medal on the track, and third to go with his bronze he won in the long jump, when he clocked 22.51,a South African record, in the men’s T38 200m final. He was beaten by Evan O’Hanlon of Australia, who set a world record in 21.82. Paul set an African record in the pool with his 1:05.70 in the men’s SB9 100m breaststroke final. Russian Pavel Poltavtsev took the gold in a world record 1:04.02. “The whole build-up to the Games has been amazing and the support from the people of South Africa, my family and friends and the Port Elizabeth community had been fantastic. “No one trains to come second as everyone wants gold, but so many athletes are going to leave here with nothing to show except memories so to give a silver medal for my country is wonderful. South Africa’s athletes did the nation proud securing 29 medals, although it was the lack of gold medals which left them languishing in 17th position. With the final medal of the night going to Pistorius, Team South Africa went away with eight gold medals, twelve silver and nine bronze.